Historically, much of the data used to describe the status of children and families has focused on needs and risk factors, and these indicators are commonly collected through a variety of state, local, and federal government sources. For example, CCC's Community Risk Ranking examines data related to child poverty, family homelessness, infant mortality, educational test scores, teen idleness, and violent felony rates among others. Yet we know that children's outcomes are defined by a complex interplay of both risk factors and the assets or resources that exist to help children and their families overcome barriers to well-being. We also know that in order to effectively improve outcomes for children and families, we must target our solution-seeking at the most local level and engage community stakeholders in our efforts to unearth the opportunities that are present. For these reasons, CCC has undertaken a comprehensive effort to establish a method through which to identify assets or resources in New York City communities, starting with the neighborhood of Brownsville in Brooklyn. We began by leveraging our Keeping Track database to provide a foundation for our understanding of the needs of Brownsville's children and families. We then met with colleagues in government, nonprofit, and academic organizations to identify data on key assets or resources that should be present at the community level. Asset data were then collected from a wide range of local government agencies to illustrate the services, supports, and infrastructure that exist in Brownsville. 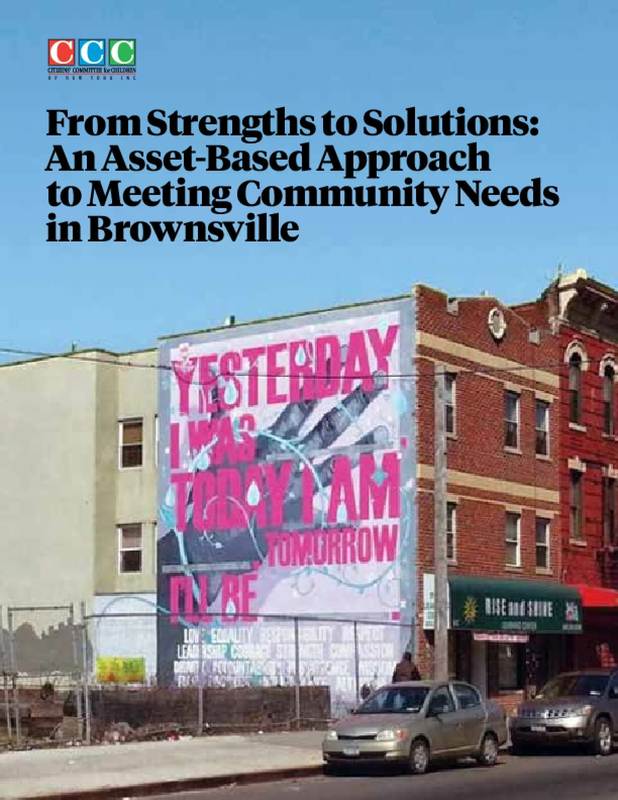 To ensure we presented a complete picture of the challenges, strengths, and opportunities present in Brownsville, we engaged residents and organizations working in the community throughout our process. These conversations helped to identify issues that were revealed through the data that required closer examination, raised additional areas of concern for which data needed to be explored, and provided a deeper understanding of the story the data was telling from the perspective of those living and working in the community. This was instrumental in gaining insights on issues such as a lack of sufficient resources, conditions within the community that limit access to services, and concerns about quality that may drive residents away from available resources. Copyright 2017 by Citizen's Committee for Children of New York. All rights reserved.